What does it mean to be human? 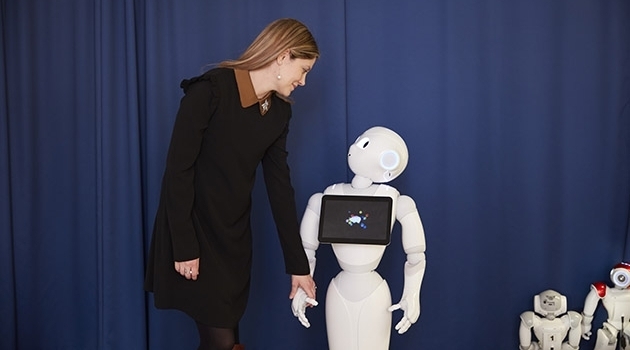 At a seminar in Geneva, Uppsala researcher Ginevra Castellano and others discussed how robots and humans could interact confidently. How can knowing more about the brain help us build tomorrow’s robots and computers, and how can it help improve treatment of brain diseases? What are the ethical aspects of new technology’s potential? These were among the questions discussed by researchers from Uppsala University and the EU Human Brain Project, in front of a packed auditorium, at a seminar in Geneva in early May. In the future, digital technology will be integrated into almost all sectors of society, including health, education, finance and transport. This is a development that will affect our daily lives in a pervasive way. The Geneva seminar, entitled “Understanding the Human Brain – Re-thinking Man and Machine”, focused on how greater knowledge about the human brain might affect digital development. The seminar was arranged by Uppsala University and the Uppsala University Switzerland Alumni Chapter, jointly with the Swedish Swiss Chamber of Commerce and the EU Human Brain Project (HBP) research programme. HBP’s goal is to create, within ten years, an electronic brain that functions according to the same principles as the human brain. Uppsala University, one of 120 research institutions taking part, leads one of the HBP’s 12 subprojects: Ethics and Society. 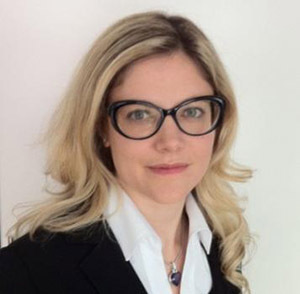 Ginevra Castellano, Senior Lecturer at Uppsala University’s Department of Information Technology, Division of Visual Information and Interaction, and head of the Social Robotics Lab, was one of the speakers at the seminar. She is researching the development of robots to support humans in areas ranging from education and healthcare to entertainment. “Close human–robot interaction makes it essential for us to understand how we, as humans, perceive robots. We have to develop robots that can interact with humans in socially intelligent and confidence-inspiring ways. These robots must have social skills and empathy. By using social robots, we’re dealing with issues that can help us understand what it means to be human,” says Castellano. Besides Ginevra Castellano, Uppsala University’s speakers at the seminar were Thomas B. Schön, Department of Information Technology, and Lina Emilsson, Department of Engineering Sciences, who also moderated a discussion between the presenters. Pictured, from left: Chris Ebell, Human Brain Project; Jörgen Sandström, Uppsala University Switzerland Alumni Chapter; Ginevra Castellano, Uppsala University; Thomas Schön, Uppsala University; Philippe Ryvlin, Department of Clinical Neurosciences, University Hospital of Lausanne (CHUV); Marc Oliver Gewaltig, Ecole Polytechnique Fédérale de Lausanne (EPFL); Lina Emilsson, Uppsala University; and Eva Fiorenzoni, Swedish Swiss Chamber of Commerce. Also taking part in the seminar were a delegation from Uppsala University led by Professor Kristina Edström, Advisor to the Vice-Chancellor on Research Infrastructure and Vice-Dean of Research at the Faculty of Science and Technology. The delegation’s activity programme also included meetings with researchers and management of the Human Brain Project and visits to CERN, the world-leading laboratory for high-energy research.